2018 was once again a record-breaking year for Airbnb in Miami, with revenue growing much faster than the year before. Total host income in Miami-Dade for 2018 was $204 million, the company announced today. That is an increase of 52% from 2017, when Miami-Dade host income was $134.6 million. Miami-Dade Airbnb revenue was the highest in Florida, followed by Osceola County. 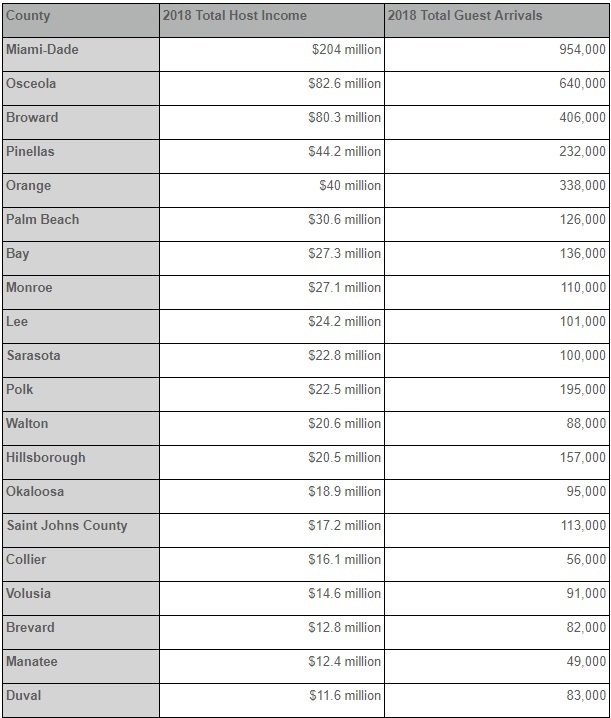 Broward ranked third with $80.3 million in revenue. For the state of Florida, Airbnb host income was $810 million in 2018. That is an increase of 80% from 2017, when host income in the state was $450 million. Airbnb revenue in Florida has nearly tripled in two years. It was just $273 million in 2016. The company says that their platform complements the hotel industry, rather than competing with it. Hotel occupancy rates, daily prices and revenue have been grown steadily despite the rise of Airbnb, they said. As of today, there are now 932,000 Floridians who are Airbnb users (as either hosts or guests), according to the company. I only stay at AirBnB’s when I travel… big value over a hotel room. You only stay in AirBnB when you travel? You mean, you dont live in an AirBnB at home? I hate strangers coming in and out of my building and it’s not allowed but people still list their units on AirBnB. I don’t care about whether AirBnB is good or not but if you have your own home, please do with it as you please. In a condo, you should respect the other people living in the condo, especially when the condo does not allow it! Conflicting reports on Air bnb banned in Sobe from Jan 4th. Any clarifications please? I have a neighbor who has a duplex. One side is rented as an Airbnb. The other side is a long term tenant. The long term tenant is constantly up and partying until 4 or 5 in the morning. He has started eviction proceedings and has been told it will be 2 to 3 months to get him out. He has since upped the partying to the consternation of the whole street. The Airbnb unit has never had one issue. And if there is, they would be gone very quickly. What the hell is in Pinellas? The county is part of the metro area that includes Tampa, St. Petersburg, and Clearwater. from the people who know .. Airbnb is the future of hospitality Real Estate ..
From people who knew 5 years ago. There are several more interesting hospitality platforms competeing for market in my. Like AirBnB, yhey are technology platforms, unlike AirBnB, they can offer an affordable, STANDARDIZED, yet stylish local experience. The future includes AirBandB, but AirBnB isnt that exciting.